This case started back in 2010, when the owners of four small businesses in California joined together in a class-action suit against Yelp. 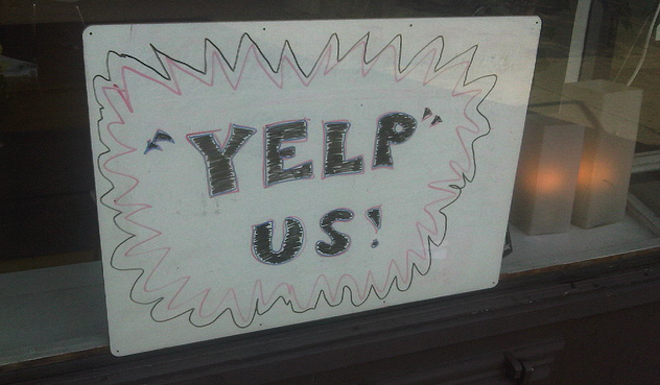 One owner says that he was contacted by a Yelp representative hoping to convince him to sell ads. Two days after he said no to the offer, he claims that several 5-star reviews disappeared from his page and that his overall rating then dropped from 4.5 stars to 3.5 stars. He maintains that this alleged manipulation of the reviews damaged his business’s reputation and revenue. A second plaintiff says they initially contacted Yelp about having a negative review removed from the site, as the complaint posted by the reviewer was outside the acceptable timeline for posting a review (i.e., the incident described by the reviewer had happened more than a year earlier). Yelp removed that write-up, but the plaintiff alleges that they then began receiving sales calls from Yelp ad reps who said they could “hide negative reviews” or “place them lower” on the page if the business paid for ads. The third plaintiff makes the claim that Yelp actually fabricated negative reviews about his auto body business “as a threat to induce [the plaintiff] to advertise.” He alleged that he began seeing negative reviews — that didn’t match up to any actual customer records — at the same time as he began receiving sales calls from Yelp reps. He also alleges that when he asked a Yelp staffer why a competing business — one that he states is known for its shoddy work — had a better rating on Yelp than his shop, the sales rep told him that it was because that competitor advertised. The lower court also described the allegations that Yelp fabricated negative reviews as “entirely speculative.” As for alleged manipulation of user-generated reviews, the court once again cited Yelp’s immunity under the CDA. Basically, the court is saying that a business has no pre-existing right to positive reviews or to be protected from negative reviews.